Friday May 9th 1902 I hurried with my work this morning as I expected Callie. When she came John had drove for her and they had brought Aunt Ellen and Mother. We had a very delightful day. Mollie went with them. This is Hatties birthday. Saturday May 12th 1902 I set some hens, baked bread, and did the regular work. Will and I were down town in the afternoon. weather cold. Will finished planting on our own farm. Sunday May 11th 1902 I was busy about the work most of the forenoon. Will went to the pasture and in the afternoon we went down home and to Mary a little while. Mollie got home before supper. 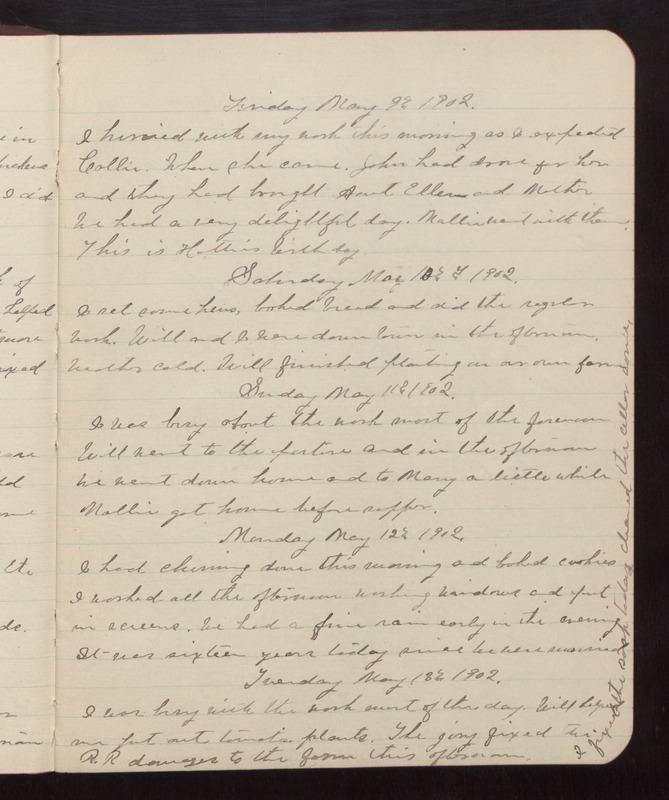 Monday May 12th 1902 I had churning done this morning and baked cookies. I worked all the afternoon washing windows and put in screens. We had a fine rain early in the evening. It was sixteen years today since we were married. Tuesday May 13th 1902 I was busy with the work most of the day. Will helped me put out tomato plants. The jury fixed the R.R. damages to the farm this afternoon. I fixed the soap today & cleaned the cellar.